Retired Alaska charter fisherman Ace Callaway has a dream to leave this world a better place and he recently found out that dreams can come true. Callaway, 57, was the winner of West Marine&apos;s annual Green Product of the Year Contest and received a $10,000 grand prize for his invention - the BlackTip Catch & Release Recompression Tool, a release device that can help save the lives of fish. "Honestly, the whole reason I even started on this journey a long time ago - over 10 years ago - is because I don&apos;t have any kids of my own and I wanted to leave something as a legacy behind me," he says. "The reception that it&apos;s gotten and the phone calls that I keep getting and the articles that are being written - it&apos;s kind of humbling." West Marine, which presented the award at the Miami International Boat Show, describes Callaway&apos;s invention as a "simple, effective and low-cost way to reduce fish mortality rates." Callaway says he started thinking about this product about 10 years ago. As a charter captain, he would see dead fish behind commercial fishing boats, and he knew he wanted to do something to save some of them. A study of barotraumas in deep-water game fish by the Oregon Fish and Wildlife Department showed that fatalities could be nearly eliminated if fish were returned immediately to their natural environment. After experimenting with methods such as baskets, bent wires and barbless fishing hooks, Callaway found that either the fish were swimming away before reaching the appropriate depth or were being injured in the process. The tool, which retails for $49.99, clamps firmly onto a fish&apos;s jaw and is lowered by hand, downrigger or rod and reel. A weight, supplied by the angler, pulls the fish down until the device hits the bottom and automatically releases. Testing revealed that a 5-pound weight works on fish of as much as 20 pounds and the tool has been safely tested with weights of as much as 30 pounds for larger fish, West Marine says. Callaway says it took years of trial-and-error to come up with his design, which now has a 20-year patent. And rather than rest on his laurels, Callaway is developing an accessory to use with the tool. He&apos;d ultimately like to figure out a way to make a multiple release that would work in the commercial fishing industry. "You can literally go behind a longliner up in Alaska when they&apos;re running their lines and you can just about walk across the dead fish in back of their boat," he says. This year&apos;s contest marked the second year of West Marine&apos;s search for green products. About 40 products were submitted for review, according to Laurie Fried, director of community relations and chief sustainability officer for West Marine. "There was a really clear winner," she says of Callaway&apos;s invention. "There was one that totally stood out from the pack." Judges for the contest included Randy Kochevar, of Stanford University&apos;s Hopkins Marine Station; Mike Sutton, vice president and director of the Center for the Future of the Oceans; Laura Strohm, president of Strohm Sustainability Consulting; Jim Leishman, owner and vice president of Nordhavn builder Pacific Asian Enterprises; Bill Lee, owner, Wizard Yacht Sales; Margaret Podlich, BoatU.S. vice president of government affairs; Larry Smith, West Marine senior vice president of allocation and planning; Chuck Hawley, West Marine vice president, product information; and Randy Repass, chairman and founder of West Marine. "The BlackTip Catch & Release Recompression Tool addresses a real problem in a way that is simple, effective and affordable," Kochevar says. "Using this innovative tool, any fisherman can make sure that a fish returned to the wild has the best possible chance of survival." 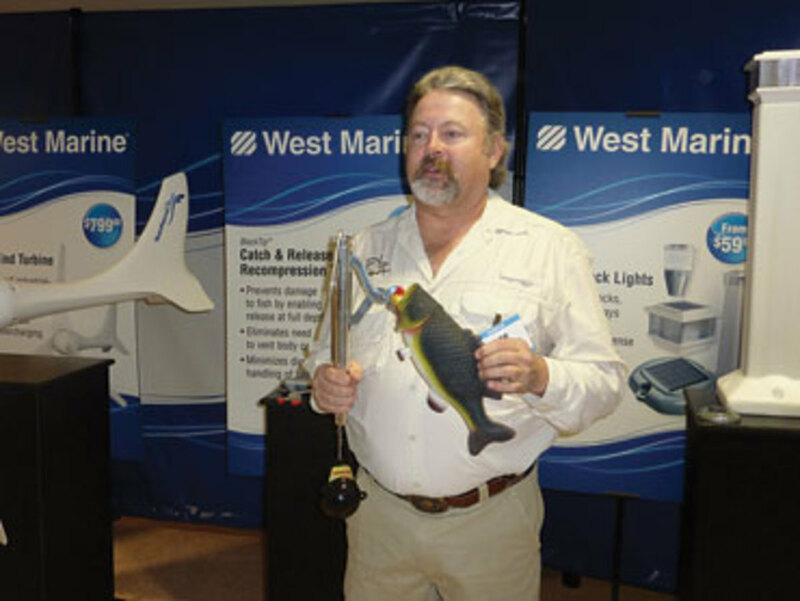 West Marine plans to hold the contest again this year and give the award at the 2012 Miami show. The company also will look for green products during its new-products buying day in June. Fried says a recent sustainability survey shows that 80 percent of West Marine&apos;s customers are either extremely or very concerned about healthy fishing stocks, and 81 percent are either extremely or very concerned about water pollution. The survey also found that when selecting products, 86 percent of West Marine customers look for those that are safer for the water and 75 percent want non-polluting products. Callaway says West Marine officials have been great to work with and supportive of his vision. "West Marine is such a fantastic company," he says. "I wanted to still be able to provide these releases free of charge to research facilities and [West Marine] was totally 100 percent behind that." The company, he says, followed his specifications precisely and even improved the product. Also, he says, West Marine understood his desire to make it affordable so anyone can own it. "I&apos;d rather save a million fish than make $1 million," he says. "I&apos;m looking forward to seeing how much it&apos;s used. That&apos;s what I really want. "The bottom line always comes down to that each of us individuals are the stewards of the resources and the stewards of our world," Callaway adds. "If we don&apos;t do it, it isn&apos;t going to get done. If all the fishermen out there don&apos;t use a release and try to put these fish back, they&apos;re not going to be saved. I don&apos;t care how many regulations you make." For more on the BlackTip Catch & Release Recompression Tool and the Green Product of the Year Contest, visit www.westmarine.com/green.